We’ve just had our busiest and best bank holiday weekend in living memory; what a scorcher! 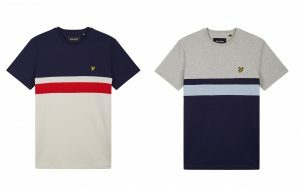 Maybe it’s to do with our fantastic new brands that we unveiled last week; or maybe the old classics like Fred Perry, Lyle and Scott and Diesel. 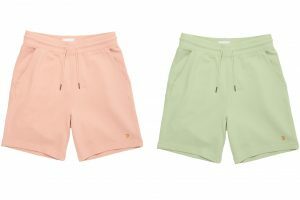 If you haven’t sorted your summer menswear yet, then we’ve got a few ideas to bolster that warm-weather side of your wardrobe. We reckon you can’t beat a T shirt/shorts/Toms outfit when temperatures are high and you’re looking good on a summer holiday. Mix and match from the following items to get your individual summer look. Don’t forget to use our offer code SUMMER18 to claim 10% off everything in this blog! One of the best seasonal T shirts we’ve stocked this Spring Summer 2018, this Farah number boasts a subtle stripe effect in Rose Marl and Lake Blue Marl. The soft yarn dyed fabric is very comfortable, as you’d expect from Farah’s 100% cotton garments, and you’ll be kept cool even in the Mediterranean heat. Sizes range from Medium to Extra Large, all in Farah’s signature semi-slim fit. 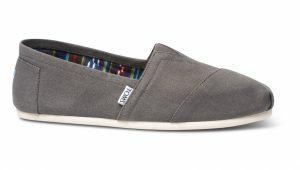 Here’s the original, classic Toms canvas shoe in Ash Grey with a flexible rubber outsole for extra durability – a tried and trusted design. Also available in Navy, Black and Natural — pick whatever colour matches your favourite shorts and/or T shirt. As ever, sizes run from 6 to 11, but you should pick a size down from your normal. Nicce are among a clutch of new brands to hit our shelves this summer (along with Gym King, Sik Silk and Ska & Soul.) They’re true summer menswear experts, as shown by this fantastic striped swim short. 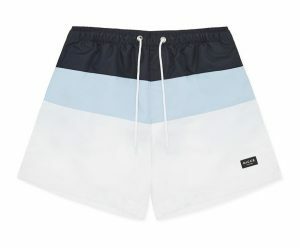 Cut and sewn panels, adjustable drawstring waist, and two generous pockets make this a highly practical short as well as looking cool. Sizes range from Small waist to Extra Large waist. For softness and style look no further than Farah’s “Shalden” sweat short. 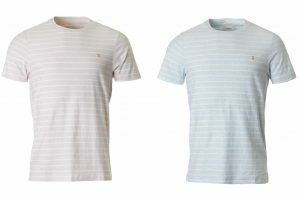 Soft washed fabric and cool, comfortable loopback cotton underlines its class. Two side pockets and a rear pocket give you more options for storage than the average sweat short. There’s three superb colours to choose from: Rose, Balsam and Yale. 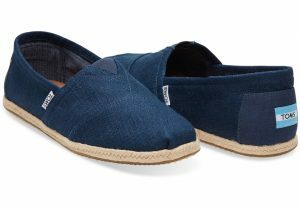 Ideal for casual wear this summer with Toms or Lyle and Scott’s new slides. Previous10% off Stunning New Sik Silk Gear!